Since 1971, Marcus & Millichap Real Estate Investment Services has been the premier provider of investment real estate brokerage services. With more than 1,200 investment professionals throughout the United States, Marcus & Millichap is the largest brokerage firm focused exclusively on investments. By specializing 100 percent on investments and organizing our sales force into property specialty groups, we provide clients with superior market knowledge and transaction expertise targeted specifically to the unique requirements of each property type. Having pioneered the industry’s most powerful marketing system, the essence of Marcus & Millichap’s value proposition is our ability to "make a market" for each property through expanded market exposure, which generates the broadest buyer interest and results in maximum value. We combine comprehensive market research, state-of-the-art technology and communications systems with access to the industry’s largest pool of private and institutional investors. The result is the most efficient process for matching buyers and sellers locally, regionally and nationally. With over 5,678 properties sold, Marcus & Millichap leads the Net-Leased Restaurant market with over $10,461,032,000 as of 2014. 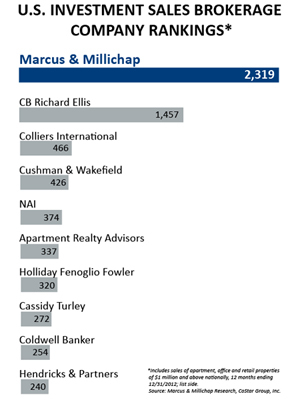 Marcus & Millichap has brokered the sale of over 1,895 Net-Leased Drugstores, totaling $8,613,374,000 in sales. Our favorite properties are todays most prestigious U.S. chains; Walgreens, CVS, Rite Aid and more.